Please note that the content of this book primarily consists of articles available from Wikipedia or other free sources online. Agdistis endrodyi is a moth in the Pterophoridae family. It is known from South Africa (Western Cape). A moth is an insect closely related to the butterfly, both being of the order Lepidoptera. 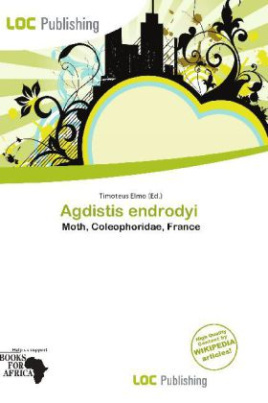 Moths form the majority of this order; there are thought to be 150,000 to 250,000 different species of moth (about ten times the number of species of butterfly), with thousands of species yet to be described.Most species of moth are nocturnal, but there are crepuscular and diurnal species.